This picture represents a crossed boundary. There are often things which you cannot understand however hard you might try. About three years ago, I laid out the boundary to our garden, in accordance with our deeds, I was a little more generous than I should be, to allow our neighbour to create a slightly wider gateway or access to the side of his house. I checked with the Laird, a man who has known both properties for many years, he came and inspected the area and confirmed that I had been more than generous with my neighbour, so there should be no issue. It was a simple barrier. Wire fencing supported by 4 inch wooden fence posts and galvanised wire. It was a gentle boundary, showing where the line was. I tacked it loosely around an apple tree in the orchard part of the garden. About 18 months later, when I returned the apple tree was completely gone. There was also a pile of logs which had been stacked at the bottom of my neighbours driveway, with rather alot from an apple tree, which he does not have anywhere on his land. It was clear that they had come from my garden. He only has one tree remaining in his garden, he left it looking like a totem pole when he butchered it five years ago and it is still fighting back with greenery this year for the first time. He set a fire underneath it, climbed up the tree after a bottle of vodka when the branches caught light and cut the branch he was sitting on, falling to the ground unscathed. He then decided the next day to take the other branches off it. I was a bit fed up, but more so when I found that my boundary had been cut through as he built his fence. It was needless to take it down and little more than vandalism. My tree had been lopped and the evidence was there in his wood pile. I removed the 8ft high log which had been left there and propped it up against the side door of the cottage in plain sight of his window. Should he wish to discuss trees with me again, I would point out that he had no business in my garden felling my trees or taking my wood without discussion. Needless to say, there was no discussion. Not that year or since he did not pass by, went away for a while and I did not see him until this year, in passing but he has not come by to speak with me, preferring to speak only with my partner. He doesn’t have a very high opinion of women, especially the ones who make decisions. The log stayed in our cottage since then, it made a good prop-barricade in case someone tried to push the door in. But a friend who helped us chop logs this week cut it up for firewood when I wasn’t looking, this is the only piece I managed to salvage. So this is all that remains of my boundary, the one he crossed. A crossed line, which I will not forget. It will stay in the cottage as a reminder to me that I should not trust him. As a reminder to him that I know what he did and of my displeasure at his actions. In the time we have had the cottage he has tried many times to fell my trees. Wild attempts to get other people to cut them down in my absence, with excuses as to why, some of which we have foiled only just in time. 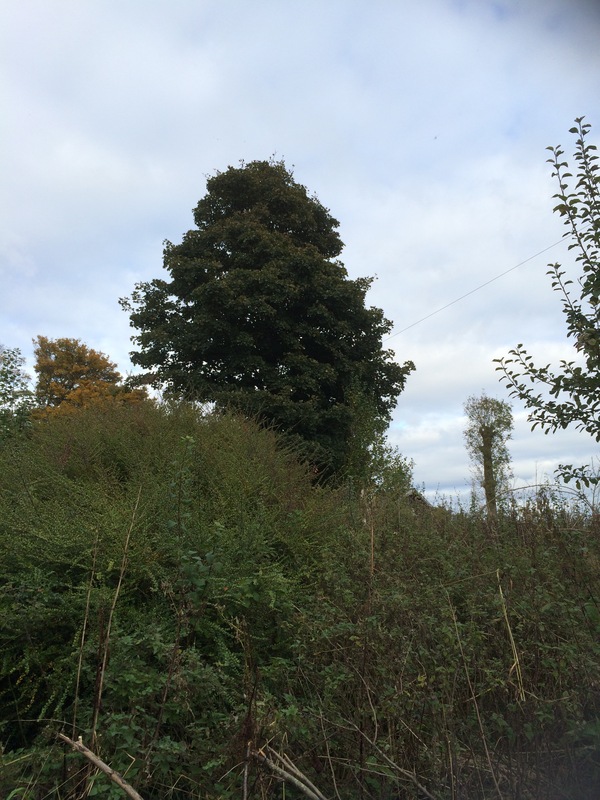 There is a large sycamore which is growing rather spectacularly and he attempted to get the telephone company only a week ago to fell it, saying that it was on his land. It isn’t. I ask myself when will he realise that I have woods here because I love the trees, they are calming, protecting and offer sanctuary and they are mine. There are none which can damage his property, they were already removed. There are none which concern him. The truth is that he doesn’t care. Some people don’t. My question is that if they resent the countryside so much, then why choose to live there? A rural location without trees and nature, well that just isn’t natural.